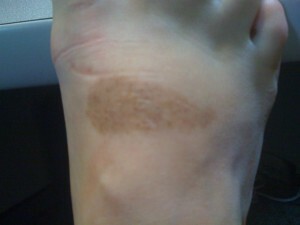 I have a birthmark on my right foot that I love. It’s pretty large, but a clearly defined shape and for some reason it’s one of my favorite parts of my body. Should I have given you warning that there would be a picture? I spent a summer traveling the U.S. & Canada with a Drum Corps, which is kinda like professional marching band. I spun a flag, slept on gym floors and on a bus for 3+ months. It was one of the things that helped shape who I am. I love thunder, but am terrified of lightening. It’s gorgeous, yes, but I think after years of running around on a football field (see: marching band) during lightning and thunder storms messed with me. I’m particularly scared of being struck by lightening in the car. I don’t know why. I cannot ever spell the following words correctly: supposed, definitely. Thanks be for spell check. Not only is my husband an artist, but my dad is too. Yes, cue the cliche about girls marrying their dads. (that’s pretty much the only way my dad & my husband are alike though). I used to want a chinchilla more than life itself. I never wanted a pony, but damnit, I wanted a chinchilla! Foods I can rarely, if ever, turn down: popcorn, jelly bellies, sourdough toast w/butter, greasy tacos, pickled or fried okra, sliced fresh tomato w/a bit of salt. I used to hate my name. I would beg people to call me by my middle name Dianne, but no one would go for it. I hated how “weird” it was, I just wanted a name that would blend in with everyone else. Now though, I love my name. I love that chances are pretty damn good that if someone is yelling GINGER–they’re talking to me. And even though I think there might be a little stigma to the name (people tend to think you’re going to be a sexpot or a ditz with my name), I think it fits me perfectly. What about you? What don’t we know about you? P.S. I’ve got a new post up on The Essentials, for those who might need some money management help! I am actually thinking hard about this one…and I’ve got nothing. Nothing. That is just so sad. I used to hate my name too. I was the only Hillary in a sea of Jennifers and Jessicas. My mom finally got so fed up with my moaning that she told me I could legally change my name to my middle name (Dawn.) I’m so glad that I didn’t. Thanks for the link, Ginger! Isn’t it funny how we always envy others’ names and features? As a kid, I always wanted more cool name. And I still envy others’ body parts.